April is the ASPCA's Prevention of Cruelty to Animals Month. Every year, the ASPCA asks animal lovers to “Go Orange for Animals” throughout the month of April in an effort improve the lives of animals. Using the ASPCA's website as a guide and some of our creative minds at Sweet Dog Organics, we have come up with a few suggestions on how to support this important awareness campaign. We welcome ideas from the Sweet Dog community, please leave a comment below with your brilliant ideas! 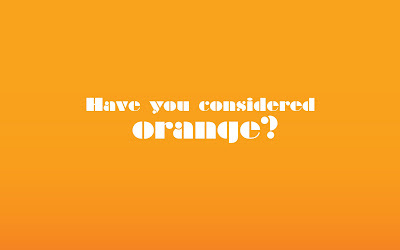 Send us a picture of your orange support of this awareness campaign and we will post it on the Sweet Dog Organics blog. 1. Organize a pet parade or special event in your neighborhood. The ASPCA is partnering with New York City for a festive block party! The ASPCA’s mobile veterinary clinics will be on site offering pet parents the opportunity to have their pet spayed or neutered for free. Owners of pit bulls and pit mixes can also take advantage of free microchipping and vaccinations. When: April 17, 2009, 8:30 A.M. to 3:00 P.M.
2. Get your town hall, grocery store, libraries or homes to light up in orange. 4. Become an ASPCA Ambassador and create your own grassroots event, inviting friends and family to sponsor your efforts on behalf of the ASPCA. The ASPCA has an ambassador site to help you get started. 5. Have an orange bank sale at your school or workplace. Donate the proceeds to the ASPCA. 6. Coordinate a ‘Go Orange for Animals’ event with a local animal welfare group or shelter of your choice and donate the proceeds and/or supplies that you collect. 7. Decorate with orange bows, ribbons and lights. You can do something simple like tying a orange ribbon to the dog's collar or leash. Sweet Dog Layla has been wearing her orange collar when she visits hospital patients. It has been a great conversation starter. 9. Spread the word through the various forms of social media (tweet this blog, write your own blog entry, comment on Facebook) The ASPCA hashas made available an ASPCA donation widget on your web page or blog. 10. Love your own sweet dog. Hug them, walk them every day.